Biography: Samuel Joseph and Valentina live in Rajahmundry, a historical city in Andhra Pradesh State, Southern India, at the head of the Godavari River Delta. Samuel Joseph, a pastor, and Valentina, an evangelist/social worker, both belonged to strong Christian families. They also are both former national basketball players. 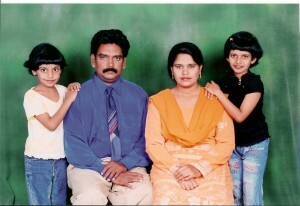 Together, they planted Jesus Saves Independent Church as a house church in a rural area that was predominately Hindu. It has quickly grown and they now have pastors networked throughout India! In the midst of mostly uneducated field workers that knew nothing about Jesus, they embraced a family whose father was handicapped with polio. All of the family came to believe in Jesus and accept the Holy Spirit. In the past five years, many of the people in their area have been able to taste Christ's love and listen to the gospel. Some of them have even broken and thrown their Hindu statues in the river. Samuel Joseph and Valentina's mission is to reach the unreached souls in the Hindu Indian Country. To fulfill this goal, they conduct youth sports and musical programs, do church planting and Bible schools, carry out child welfare schools and orphanages, old aged homes, day care and health centers to support the needy, translate books, distribute them and have regular gospel outreach ministry. Strengths: Samuel Joseph and Valentina have a heart for the people. Their gifts and talents are best expressed through their youth sports programs.